Joseph. L. McAnelly was born in Newcastle and educated at St. Hughes College Cambridgeshire. He is an Honours psychology graduate of the Open University. In 1979, after completing the appropriate examinations set by the National Council of Psychotherapists, he became a licentiate member and established a practice in Westerhope. In 1981, upon further examination, he attained accredited membership of The National Council of Psychotherapy In addition to work in psychotherapy he has been actively involved with the North East Council on Drug Addiction and has worked as a counsellor in all aspects of drug related problems. In 1982 he studied Rational Emotive Therapy and Cognitive Behavioural Therapy with Dr Frans M. J. Brandt and achieved a diploma in both subjects. 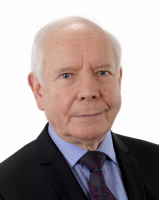 Mr. McAnelly has been involved in various group therapy projects such as "Rational Slimming," and has participated in local T.V. and radio programmes. He is also a Master Practitioner of Neuro-linguistic Programming- taught and accredited by Dr Richard Bandler (founder of NLP) as well as being a member of the International Stress Management Association. In Addition, he is a Graduate Member of The British Psychological Society and a senior accredited member of the British Association for Counselling and Psychotherapy.